You’ll need a full belly of goodness to help save the day! 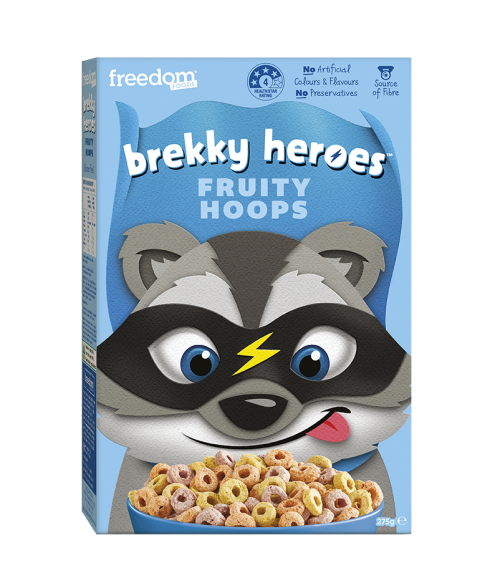 With no artificial colours and flavours, no preservatives, and a source of fibre, you’ll be saving the world in no time. ^ Free from Gluten as found in Wheat, Rye, Barley, Spelt and Triticale and does not contain oats. Rice Flour, Cane Sugar, Whole Grain Sorghum Flour, Maize Flour, Cocoa Powder (5%), Chickpea Fibre, Psyllium Husk, Flavour, Salt, Canola Oil, Emulsifier (Sunflower Lecithin). You’ll need a full belly of goodness to help save the day! Just ask Captain Boulder – with no artificial colours and flavours, no preservatives, and a source of fibre, you’ll be saving the world in no time. 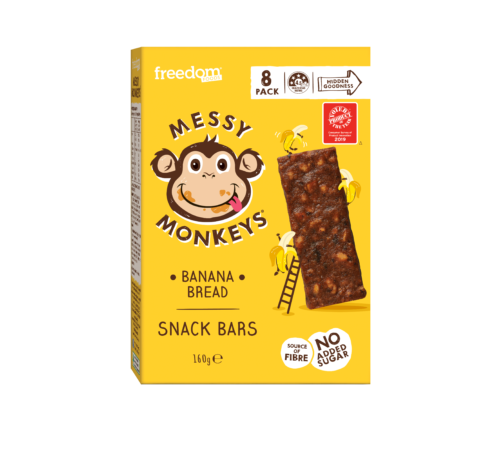 Messy Monkeys Snack Bars are made with real fruit & legumes, and have no artificial flavours, colours or sugars – no nasties! 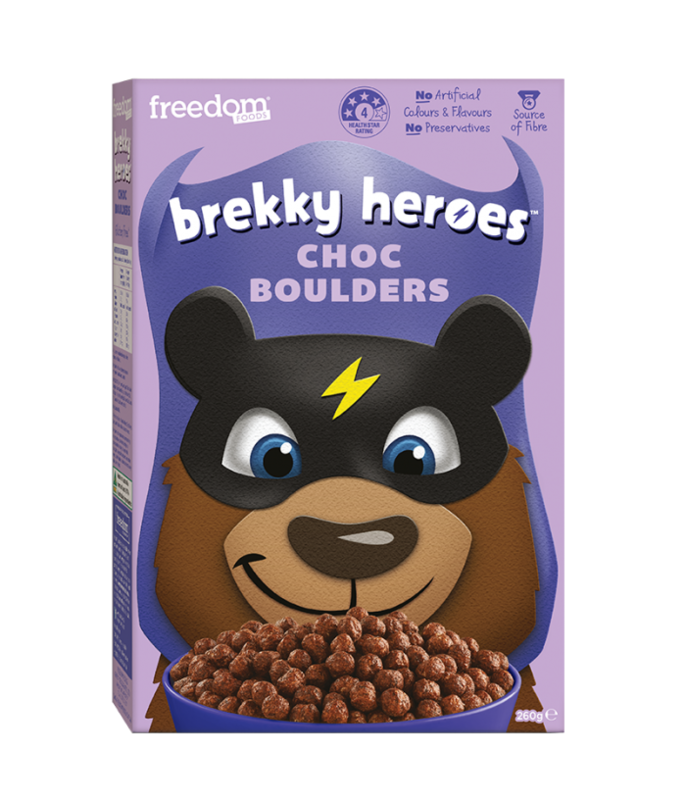 Messy Monkeys Bars are low in saturated fat, and for kids aged 4-8 they are 18% of their daily fibre needs*! They are the perfect snack for your active monkey to have more fun. 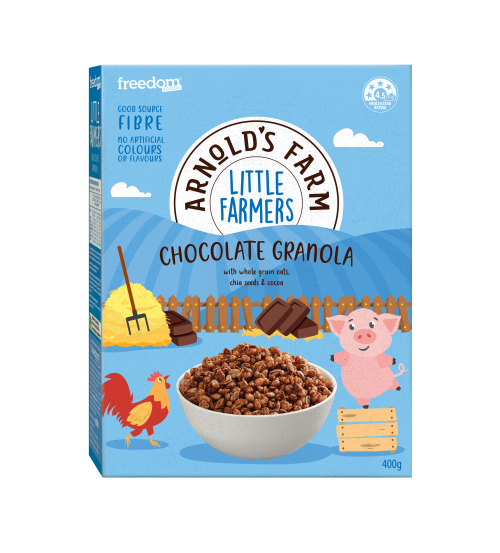 Our Little Farmers Chocolate Granola combines the goodness of rolled oats, puffed rice, chia seeds and cocoa to create little clusters for little mouths.